Lena, from Kidz 'n' Cats range, is a stunning chestnut-brown haired 46cm/18" vinyl play doll. She has a gorgeous fresh, natural face with fixed lifelike brown acrylic eyes and long brown lashes. Her lips are painted in a fresh coral pink, as are her nails. Lena has a very long, beautiful brown wig with a fringe made of high quality kanekalon, considered the best fibre for doll hair, in which she 2 bows to co-ordinate with her dress. She is a highly poseable doll, having 11 points of articulation, 2 more than Happy Kidz as her wrists are jointed, too. These joints mean she can be positioned in a natural way, very appealing to an older child's imagination. Her arrival clothes consist of an A-line deep red knitted dress over a red lace petticoat-like skirt. She wears gorgeous pale grey detailed tights and on her feet she has red shoes with bows! 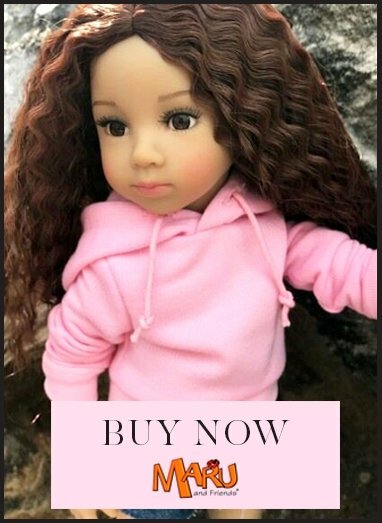 Lena is safety tested for children from age 3 but My Doll Best Friend recommends her to children age 8 and above as jointed bodies can be tricky to pose and slimmer full vinyl bodied dolls are hard not soft to hold, cuddle and play with. The clothes, shoes and accessories on this website fit Lena, unless specifically stated to the contrary. For Kidz 'n' Cats footwear, go to Footwear for 46cm (18") dolls. Lena's hair can be cared for by the Essential Doll Hairbrush, highly suitable for wigged hair as it detangles whilst being gentle on the hair.